Winning in business is often about being the fastest decision-maker. In a world where insight and connectivity are redefining the rules, the IoT is becoming critical to capturing success and overcoming disruption. 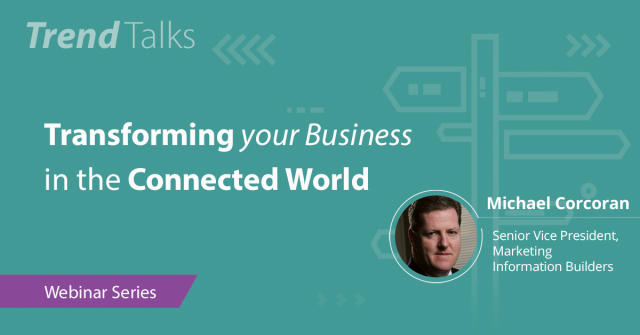 In this session, we’ll explore the promise of IoT in terms of innovation and new business models, as well as the potential pressures you’ll face in ingesting, storing and processing the oceans of data generated by millions or even billions of devices. Discover which new capabilities will be critical to your success, and what actions you need to start taking now to adapt your business for the IoT. What are the hottest trends in BI? Join this webinar with independent analyst, Rick van der Lans as he shares his key predictions for the coming years. So many new technologies have been introduced lately and organizations have so many new requirements, that the dynamic world of BI keeps evolving. Attend this webinar to learn about the following five BI trends: (1) Continuation of self-service BI (2) Analyzing streaming data (3) customer-driven BI (4) Data science (5) Data privacy and protection. Many organizations have invested heavily in BI projects. But has it all been worth it? What’s the value to the business? Or in other words, what’s the business case? In this webinar, the direct relationship between data and business intelligence and the quality of decision making is shown. The domain of business intelligence is to support decision making with the right data at the right time and in the right form. Join independent analyst Rick van der Lans to hear about the differences the importance of how BI will influences all decision making processes. Internet of Things (IoT) data is often isolated within companies – and that means lost value. Even when you begin to integrate IoT data with the business, today’s big data analytics approaches don't support real-time insight and action. Leading firms differentiate themselves by integrating business information with IoT data to create better customer experiences and more efficient operations. This is achieved by building integrated systems of insights that bring together the right people, processes, and analytics technology in a closed-loop process. Worried about the future of Etherium, Hyperledger Fabric, and all of those other technologies? Blockchain promises to provide a stable, universal foundation for transactions ranging from supply chains to healthcare to financial services. Companies are concerned about the risk, but the problem isn’t blockchain – it’s the blockchain technology market. La gestion de la donnée évolue : les volumes à gérer augmentent, les types de données varient, et les entreprises ont besoin d'y accéder de rapidement. La donnée devient volative et pour faire face à ces enjeux, Information Builders propose des solutions d'intégration afin que tout le système d'information des entreprises puisse bénéficier de cette architecture. Dans cette session vous aurez un aperçu des solutions d'intégration iWay fournissant un environnement robuste et flexible et permettant de répondre aux divers besoins d'intégration. How can data science and artificial intelligence be used for the good of society – and what happens when they aren’t? In this thought-provoking session, we’ll explore the tricky interplay between technological advances, desired business outcomes, and the perceived value to both organisations and individuals. We’ll look at some companies that are exemplars of fair play, transparency and privacy, as well as some that push the boundaries for their own gain. Lastly, you’ll be introduced to transferrable best practices which can provide a solid foundation for the ethical use of data in your own environment. Les capacités analytiques évoluent, elles ne sont plus seulement disponibles sur les plateformes traditionnelles de BI, mais aussi et de plus en plus intégrées aux applications professionnelles utilisées au quotidien pour optimiser les processus et fournir des analyses opérationnelles réactives. Cette session éducative vous permettra d'aborder de nombreux cas d'usage d'analytique intégrée susceptibles d'être sources d'inspiration pour vos propres projets. Vous découvrirez également le point de vue d'analystes sur l'analytique intégrée, et quel peut être l'avenir de l'analytique pour servir les clients, collaborateurs et partenaires commerciaux. Join our webinar to learn about five hot trends for 2019 that can help you meet new requirements for competitive advantage in the digital age and further support your organization’s ability to leverage data and analytics. With artificial intelligence (AI) and machine learning (ML) taking center stage, there are many more opportunities to gain insights that drive business value. Data and Analytics, the Original Power Couple – Forward-looking organizations understand that to achieve analytics success, they need trusted data first. Next-Gen Embedded Analytics Deliver Next-Level Customer Experience – Data monetization and customer-facing analytics have been adopted by organizations to create added value for their customers. Next-gen embedded analytics apps will take this to the next level. Smart Ecosystems Alter Your Data Strategy – Integration of diverse data types coupled with more digitization and automation will shift the way we interact with technology. Artificial Intelligence Gets a Helping Hand From Human Intelligence – Human intelligence is the check and balance that ensures artificial intelligence makes the best choices for us all. The Industry Catches Up to the Reality of Insights at Scale – Organizations require broader fact-based decision-making and must empower more people with easy access to the information, answers, and insights they need. La réussite dans son activité professionnelle est souvent associée à la rapidité de décision. Dans un monde où l'information et la connectivité définissent les règles, l'IoT devient essentiel pour assurer son succès. Dans cette session, nous explorerons ce qu'implique l'IoT en termes d'innovation et de nouveaux modèles d'activités d'entreprises, ainsi que les potentielles difficultés auxquels vous devrez faire face pour ingérer, stocker et traiter des volumes conséquents de données générés par des millions, voire des millers d'appareils. L'IoT nécessite la mise en place de nouveaux processus, l'innovation et l'utilisation de technologies analytiques avancées pour en exploiter tout le potentiel. Quels sont les nouveaux défis engendrés par l'IoT pour les entreprises? Quels sont les pré-requis et les processus à mettre en place pour assurer la réussite de son organisation ? As the future seems to get closer every day, forewarned is forearmed. Predictive analytics are enabling earlier identification of emerging opportunities, and allowing organisations of all kinds to proactively detect and avert problems, from component failure to fraud and employee churn. But predictive analytics isn’t a single technology – rather it’s a blend of advanced tools and techniques, wrapped in a coherent strategy. This eye-opening session explores how you can harness the power of prediction in your organisation to tangibly change outcomes, increase agility and reduce uncertainty. Comment la "Data Science" et l'Intelligence Artificielle peuvent être utilisées pour le bien de la société? Et que se passe t-il si ce n'est pas le cas? Dans cette session incitant à la réflexion sur ce thème, nous explorerons l'interaction complexe entre les progrès technologiques, les résultats souhaités et la valeur perçue à la fois par les organisations et les individus. Nous étudierons également des exemples concrets à partir desquels nous proposerons quelques recommendations pour tendre vers un usage éthique des données. The Australian tertiary education sector is one of the preeminent education sectors in the world. This webinar will discuss your data challenges and how our solutions can breakdown your data silos to enable you to create a data driven culture to differentiate your institution. Analytics capabilities have evolved – no longer necessarily delivered through traditional BI platforms but increasingly integrated into everyday business applications to optimise processes and provide reactive operational analysis. This insightful session will walk you through some of the myriad use cases for embedded analytics, to inspire your own projects. You’ll also hear the analysts’ perspective on embedded analytics, and how the future is likely to unfold as organisations gather momentum in creating analytic applications to serve customers, colleagues and partners. Data is variously heralded as the new oil, the currency of the digital economy, and the lifeblood of business. But the companies that are truly changing the economy are those that are most progressive in thinking differently about data, like the Ubers of this world. In reality, most businesses have a wealth of data but simply haven’t grasped the idea that data could become their raison d’être. In this stimulating session, discover how to overcome the cultural as well as technological challenges that stand in the way of positively impacting the bottom line through data – and your business becoming renowned as an innovation pioneer. Analytics answers questions and suggests new paths to success. However, to be sure of those insights you need to be sure of your data. See how Information Builders technology allows you to consume, manage, validate, and publish data for analytical and operational purposes while supporting business objectives and informing business users. Every single item on a company mission statement relates to data at some level. It is from the position of data expertise that the mission will be executed and company leadership will emerge. The data professional is absolutely sitting on the performance of the company in this information economy and has an obligation to demonstrate the possibilities and originate the architecture, data and projects that will deliver. After all, no matter what business you’re in, you’re in the business of information. Organizations today need to take advantage of the numerous relevant data platforms to which they provision their data. Platforming the data correctly is a key indicator of workload success. This leaves the progressive organization with more data platforms than ever before and with a clear need to make them all work together. Throw in multiple clouds and the data integration challenge moves exponentially. Data integration is at an all-time high in terms of need and shows no signs of abating. The speaker will share from experience some of the hallmarks of mature, leading data and data integration environments that leaders will be guiding their data environments towards in the next few years, with the goal of helping true data leadership emerge. Data monetization is about harvesting direct financial results from having access to data that is stored, maintained, categorized and made accessible in an optimal manner. Traditionally data management & analytics has contributed indirectly to financial outcome by aiming at keeping data fit for purpose in the various business processes that produced value to the business. Today the best performers are using data much more directly to create new services and business models. In this webinar, Henrik Gabs Liliendahl, a seasoned data management consultant, along with Rado Kotorov, Information Builders’ data monetization expert will explain how you can adapt data management practices and use technology wisely to monetize on the data within your reach. How can you take advantage of predictive and prescriptive analytics for improving your business models? In this webinar, Stephen Smith, a well-respected expert in the fields of data science, predictive analytics and their applications, will explore how you can operationalise data science to unlock the power of these predictive models. In conjunction with Information Builders’ analytics expert, Bruce Kolodziej, we will cover the definitions and use cases of prescriptive and prescriptive analytics, and how you can implement these models to the benefit of your organisation. Information Builders helps organisations transform data into business value. Our software solutions for business intelligence and analytics, integration, and data integrity empower people to make smarter decisions, strengthen customer relationships, improve employee performance, and drive growth. WebFOCUS and iWay products cover all information needs – from data inception to information quality and delivery. The market’s leading business intelligence platform, WebFOCUS scales easily to extend the power of analytics to everyone. iWay products simplify the integration of complex data and application environments to deliver projects on time and on budget, capture lost revenue, and eliminate hidden costs generated by inaccurate data. Our dedication to customer success is unmatched in the industry. That’s why tens of thousands of leading organisations rely on Information Builders to be their trusted partner for developing and executing a world-class information strategy.